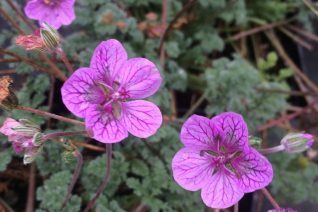 ‘Pickering Pink’ Cranesbill. The name sounds like it will have an all pink flower. Not really. 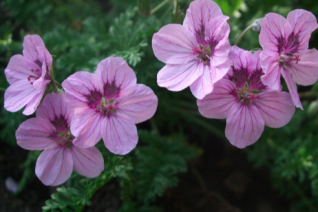 The simple five petalled flowers have two petals that are pink on top with a distinct black blotch. The two lower petals are soft pink almost white. This contrast of colors gives this small plant extra impact as well as a fun wild flower appeal. It forms a tight mound of soft, divided foliage to 3″ tall by 10″ wide. The cheery flowers are born on 6″ wiry stems. Blooms appear continuously from mid-spring to frost. Erodiums bloom and bloom with little intervention from the gardener. They also excel in the rough life of hellstrips. In borders, rock gardens, containers, even small meadow gardens this European native is excellently adapted to our climate. Light summer water increases the flower display and spent flowers can be snipped to not only spur more but to achieve a tidier look. Evergreen foliage and low stature also make it appropriate between pavers. Some deer resistance as well as rabbit resistance. Very easy to grow. Full sun. A blooming marvel is this perennial. I’ve had it in bloom in every month of the year. Beginning in early spring a truly phenomenal constant show of soft lavender flowers with a deeper purple blotch on the upper two petals. Very wildflower looking and it forms a contained clump about the size of an apple pie. The flowers born on 6″ stems should be lifted away when spent to encourage more. Not that much encouragement is needed. Full sun to quite a bit of shade in rich, well drained soil. Little summer water once established. A little water in the heat of summer will promote bloom. Evergreen low finely divided foliage is gray green and pretty with the flowers. No cutting back, easy, everblooming. Low water. What more could you want? Cranesbills come in all colors but this is one of the most garden worthy, in fact its one of the best perennials for our climate. A GREAT PLANT PICK. Tightly clumping perennial with frilly silver intricate leaves. Beginning in spring and continuously to frost a constant supply of soft yellow cupped flowers on 5″ stems. Pale yellow with silver. YUM. Full sun and rich to average WELL DRAINED soil. Light to little summer water- actually once its established I never water it and everything is just fine. Nice en mass. Rock gardens- thrives in the hellstrip. Not a fan of shade. 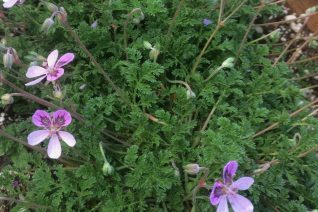 Winter deciduous- unusual for an Erodium. Long lived. 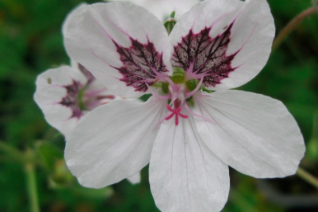 One of the most outstanding cultivars of the larger Cranesbills. Fine, dense, frilly aromatic grass green foliage makes a tight pie sized low clump. From spring and continuously to fall 6″ stems produce multiple pure white flowers. The upper two petals have a central blotch of inky black. Very cool effect. 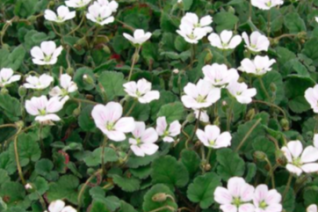 This is an easy to grow low maintenance perennial for full sun, well drained soil and light to little summer water. The front of borders, rock gardens even troughs. Seldom without flowers. Evergreen. A really pretty, floriferous perennial. 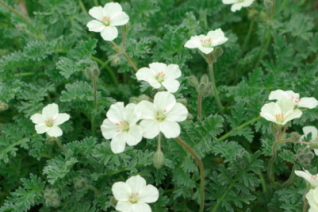 Adorable ground cover cranesbill that greets summer with a continuous supply of dainty pure white flowers. Evergreen and completely prostrate with sage green foliage creeping densely along the ground. Rich, WELL DRAINED soil that is not compacted in full sun to part shade. Makes a tidy looking small scale ground cover. Works between pavers as long as the soil does not become too compacted. Add compost annually and that will help. Light but consistent summer water. Hardier to cold than listed in literature. Obviously they haven’t grown this little sweetheart. If you’ve never grown any of these selections of Crane’s Bill- Erodiums which are close Geranium relatives you really are missing out. This cultivar is a Xera favorite. Low clumps of dense frilly gray foliage are evergreen and a cool canvas for the constant supply of outward facing luminous lavender purple flowers on 8″ stems. Continuously from March to October it produces these simple flowers that have a darker purple blotch on the bottom two petals. Much wilder looking than hardy Geraniums they are invaluable because they take up virtually no space- and again their bloom season is phenomenal. Not bothered by pests of any kind- including slugs and snails. Deer mostly over look them but they will dine if their attention goes that way. Full sun to quite a bit of shade which does not diminish their blooming power. Well drained soils of average to slightly enriched fertility. Remove spent flower spikes to to tidy and encourage more flowers. Forms a clump to 1′ wide in time. Fantastic plant. Come on join us in the world of Cranesbills.